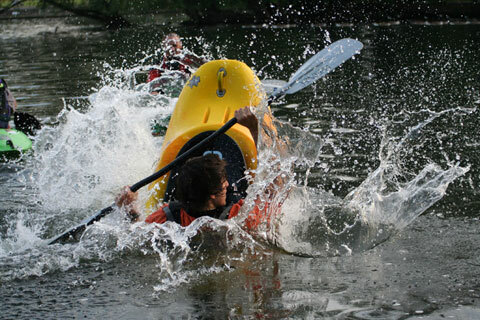 Freestyle kayaking is also known as playboating. Whatever you call it, don’t expect to keep your hair dry. Freestyle Kayaking, also known as playboating, is all about ‘playing’ on the spot, whether that be flat water or fast, dynamic white water. Paddlers use ultra short boats which are designed to surf and spin across the water, allowing a large range of freestyle ‘play’ moves to be accomplished, or at least attempted. Freestyle Kayakers can use standing waves and holes to impart extreme motion to their boat. At the competitive level, freestyle paddlers gain points for every different rotation they can perform, so they aim for cartwheels, spins, barrel rolls and loops. Additional points are awarded if they can launch their boat out of the water and up into the air. It’s a fun sport which relies on rapid reactions, toned muscles and a bomb proof roll – after an hour of playboating you’ll certainly feel like you’ve had a hard work out. London has a variety of good freestyle kayaking spots – many of them provided by the Thames weirs in the west of London. All weirs can be extremely dangerous so should not be approached unless you are an experienced canoeist or kayaker who understands weir dynamics and water flows. Always paddle with friends in case rescue is needed. The new Legacy and Olympic white water courses at Lee Valley have also provided us with some stunning white water which is perfect for Freestyle Kayaking.